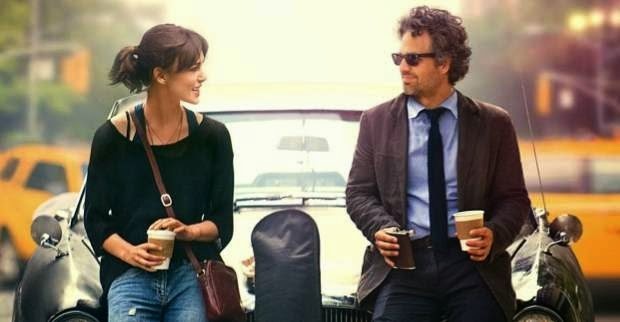 Begin Again is an unexpected gem of a movie; I didn't know much about the film before I saw it, except that it focuses on music and stars Keira Knightley and Mark Ruffalo. No matter what you know ahead of time, though, it's an interesting ride that is as much an homage to music as to New York City itself, and all of the leads are great in it. The film opens with Gretta (Knightley) reluctantly taking the stage at a bar to play one of her new songs. Once she starts playing, the bar customers are mostly still talking amongst themselves and ignoring her, except for one man, Dan (Ruffalo), who listens intently. After the song is over, he approaches her about signing her to his record label, not telling her that he recently got fired (that day, in fact) from the label. The film then becomes non-linear, as it rewinds and shows us the day so far from Dan's perspective, and how events led to him listening to Gretta play her song in the bar. At another point, we rewind to when Gretta first came to NYC, with her singer boyfriend, Dave (Adam Levine), because Dave had just been signed to a major label. Dan gets the idea of recording an outdoor album - everywhere and anywhere in New York - and the movie takes off from there. I loved, loved, LOVED the music in this movie. One of the coolest parts of the film was when we see the day unfold from Dan's perspective (Ruffalo's), and he listens to Gretta play her song and can imagine all the background accompaniments to it - it was like an invisible cellist, violinist, pianist, drummer, and more were playing. The songs in the movie are mostly sung by Adam Levine (of Maroon 5), Knightley, and others, and so I'm excited for the soundtrack to be released in early July. Yes, definitely see this film, although it may be playing in limited release in this area. I will say that I didn't really think that Hailee Steinfeld or Catherine Keener's parts were entirely necessary to the story - they play Ruffalo's character's estranged wife, and daughter - but otherwise the film could have veered in a different direction, especially without Keener's character (Steinfeld is good here but underused). I loved seeing NYC on screen, as well, since I've been there a few times and recognized a few places, and the movie is fun but at the same time manages to be more serious than your typical "summer flick" in parts. I'm not sure how this movie will do at the box office, but I hope it does well, because it's one that I think most people will like. Begin Again is currently playing in theaters and is rated R with a runtime of 104 minutes. 4.5 stars out of 5. I haven't seen this yet but it does sound like something i'd enjoy. I haven't heard of this! Glad to see Kiera Knightley playing a different type of role. I've read several good reviews for this movie stating as you did that New York is almost a leading character. Interesting! Yes, NYC definitely is like a character in the movie. I am a Keira Knightley fan and love all her movies. Your review sold me and I'm going to watch for this movie so I can enjoy it too. Adam Levine? Heck yes I'll be seeing this film! Seriously, though, Knightly and Ruffalo are two of my favorite actors. I hadn't heard about this movie so I'm glad you shared the info. It's going on my to see list! I haven't heard anything about this film but your review has me curious. I wonder i it will be released near me, we tend to only get the big mainstream films. This sounds like a great movie! I might have to actually hit up a theater! I love the actors in this movie and want to see it! Great review- I'm happy you liked it! I have not heard of this movie. But I am not very movie savvy. It sounds neat. I have never heard of this movie and it looks really good. I will have to check it out. Another great review. I love music in movies and shows too, this might be for me. haha! Thanks for the review. I've been wanting to hear more about this movie. The trailers for this film are so adorable, and I love Mark Ruffalo in anything. I like seeing Keira Knightley playing something other than a lot of her regular UK based period pieces. This does look like more than just a chick flick, and I love when films do flashbacks to character's backstories. Maybe I'm in the minority, but I really cannot stand Adam Levine, so maybe this role will help change that. That's funny. This was his first movie role, I believe.